Red-tip photinia (Photinia x fraseri): growing, planting, caring. A popular hybrid - loved fo its red juvenile leaves. Probably the most popular photinia, ’Red Robin' is a dense medium-sized cultivar with glossy, elliptic leaves to 10cm in length, bright red when young and later dark green and creamy-white, rather sparse flowers. Photinia is a genus of 40 to 60 species of shrubs of the family Rosaceae and are native to the Himalayan and Asian strain. The photinias found in our country are mostly hybrids and used as an ornamental shrub alone, in beds, or in monospecies or mixed hedges. The interest is then in their two-color almost permanent character: young leaves are indeed red and turn dark green as they age. They bloom from April to May with small flowers grouped at the end of branches. The most common variety is 'Red Robin'! Plant the photinia from October to March out of freezing period - a planting before the winter allows a better rooting - in a sunny situation. Photinias gracefully accepts any type of soil. In hedge, separate each plant at least 80 cm to 1 m for a hedge about 2 m high. Before planting, prune damaged roots and branches to balance root volume and aerial volume. Plant in a hole at least twice as big as the root ball. Soaking the roots before planting will greatly improve the chances of recovery. Plant being careful not to bury the base of the trunks. Form a bowl around the base that will be used for watering during the first months. Tamp the soil around the roots - do not hesitate to use all the weight of the body! Finally water until filling the planting bowl, at least two watering cans! Prune your photinia at least twice a year: after spring bloom and after autumn sprouting to balance the shrub or reduce its branches. 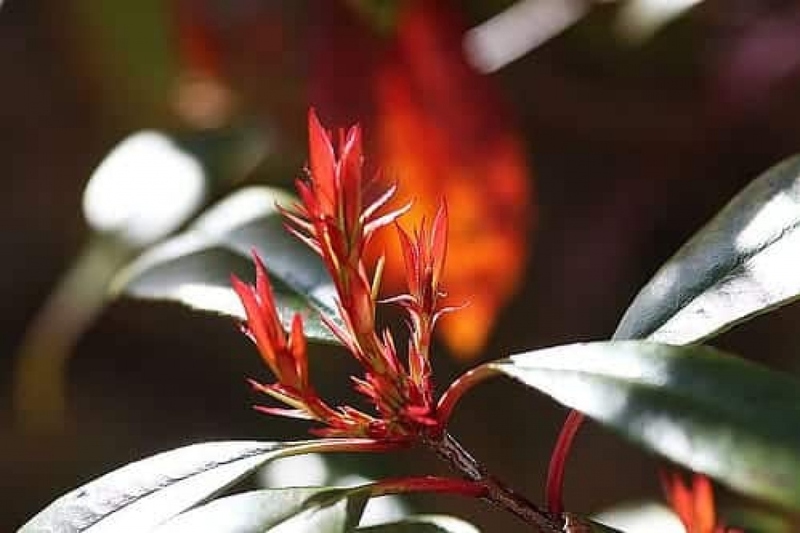 You can also make a pruning of Photinia 'Red Robin' at the end of winter: this pruning favors the appearance of red leaves! The more you trim, the faster the shoot grows! Know in any case that photinia can be modeled to the shape you want, without much difficulty. Start by removing the old branches, to promote the growth of the young shoots. Then clear the center to allow the light to enter the heart of the tree. Water thoroughly the first few weeks. Beyond the first year, you shouldn't need to worry about watering any more, except in the event of serious drought. Water copiously but infrequently to encourage the root system to seek water deep underground. It's therefore suitable to water until the planting basin is full and only empties slowly.